On Scene: Getting Halloween Ready: Costume Gear for the Kids. Getting Halloween Ready: Costume Gear for the Kids. Halloween is just around the corner, and maybe your kids are just begging to dress up like their favorite heroes. The good news is TheFireStore has got you covered. With our high quality Kid's Gear & accessories, they'll be spitting images of their First Responder Heroes. 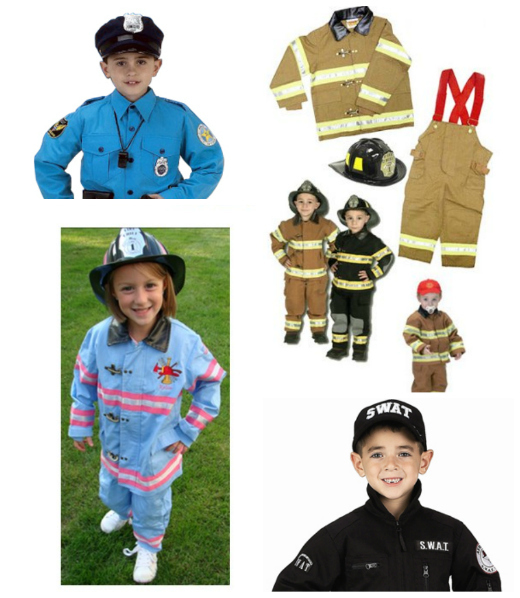 Whether they want Firefighter turnout gear with an amazingly close resemblance to the real thing, a Police Uniform, a Jr. SWAT costume set, or a more girlish version of Turnout Gear, TheFireStore has it. This Gear isn't your cheap costume-shop stuff either. It's made to look so much like the real thing, is made of a higher quality material*, and has all the same details as the pros! You don't have to bother with piecing all the parts together like at regular costume places either, as our costumes come with most everything you need for a full, complete look. It's not just the little ones needing costumes. Are you are an adult looking for a Turnout Gear costume? We've got that, too! Our costume gear can be personalized with Embroidery, too. So be sure to check that out for an added touch. *These costumes look just like real firefighting outfits; however, they are not designed for high heat or firefighting. For children's play use only.